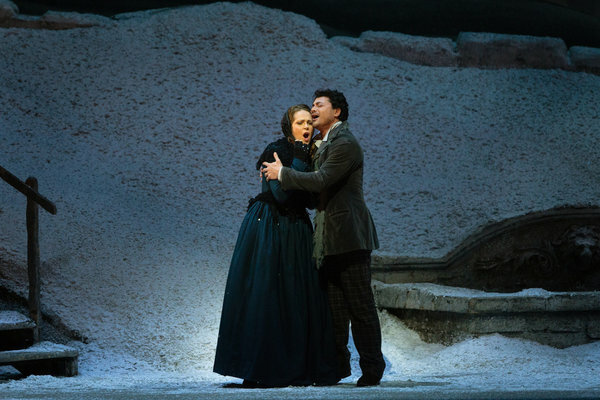 As just about everyone knows, Puccini’s “La Boheme” is the most performed opera in Metropolitan Opera history. Franco Zeffirelli’s classic 1980s production, featuring a detailed reconstruction of the Latin Quarter in Paris that includes what seems like hundreds of people, was performed “Live From the Met in HD” on April 5, 2014 at Sullivan County Community College in Loch Sheldrake. 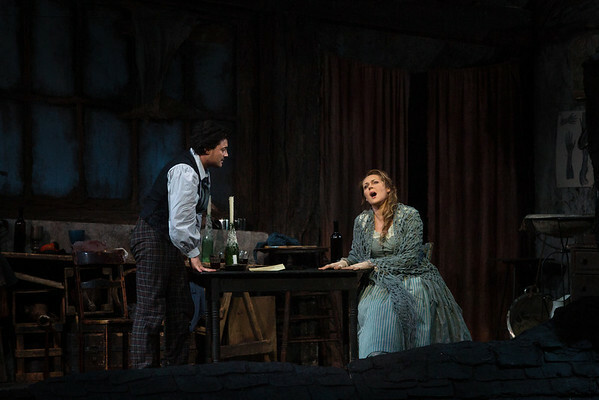 As just about every operagoer has experienced, the two leading roles in Boheme are usually performed by a soprano and tenor from the opera company’s “A-List.” In past years this has afforded audiences the ability to see on stage the singers they heard on their recordings: their Bjorling/De Los Angeles, or their Pavarotii/Freni, or Tucker/Albanese or Domingo/Scotto et al. Not so this April 5 performance. And for those of you who did not attend because you claim to be “Bohemmed out,” you might have experienced a different Boheme than usual, the one I witnessed. Without two superstars in the leading roles, with all singers of equal craft, the story itself – that of Parisian bohemians – becomes what was probably the essence of the novel and play the opera was based on – not a love story about two people who just happen to have close friends that they live with, but a story in which all the characters are part of a specific lifestyle which they have chosen to adopt and ergo to adapt to. Possibly because they refuse to grow up, and only death can move them forward. 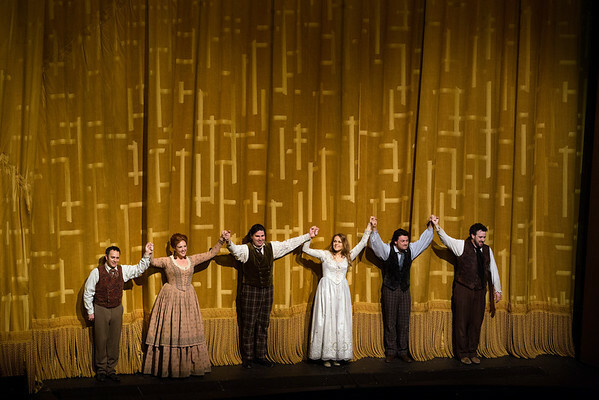 At no other performance of Boheme have I witnessed such clarity and understanding in the camaraderie of four men who live together, beautifully portrayed by Vittorio Grigolo as Rodolfo the poet, Massimo Cavalletti as Marcello the painter, Oren Gradus as Colline the philosopher, and Newburgh baritone Patrick Carfizzi (photo left) as Schaunard, the musician. Despite their individual personalities and different visual appearances, they meshed into a singular expression of 1890s beatniks. In the “other” leading role, soprano Kristine Opolais (photo top with Vittorio Grigolo), who had just sung the title role of Puccini’s “Madama Butterfly” for the first time at the Met the night before, was awakened at 7:30 a.m. Saturday with a phone call from the Met’s general manager, who made a bold request: Could she possibly sing the role of Mimi that afternoon in to replace an ailing Anita Hartig? While she had sung the role of Mimi at the Vienna State Opera and elsewhere, she had never done it at the Met. Last minute replacements always add excitement to a performance, and this was no exception. If Opolais’ energy seemed low, it was easily acceptable, as she sang with tenderness and lovely phrasing. Her acting was understandably not as secure as that of tenor Vittorio Grigolo, who was perhaps the “best’ singer of the afternoon, ensemble singing notwithstanding. I suspect that without the viewing of the subtitles and the awareness of the camaradic acting, the listening audience may not have had as positive a reaction as I did. Interestingly, having already seen Zefferelli’s visually exciting production a few times, for me, the highlight of the afternoon was offered by the excellent Musetta, Susanna Phillips (at center in photo left). I do not know if was she or conductor Stefano Ranzani who chose to take Musetta’s Waltz a trifle slower than usual, adding a nice leisurely and sensual respite to the frenetic energy that was created by the mobs of people and the bubbling activity in the second act. This slower version may also not have been as well appreciated on radio. Next in the Live from the Met in HD series is Mozart’s masterpiece, “Cosi Fan Tutte” on April 26 at 1:00 p.m. with Boheme’s Musetta, Susanna Phillips singing and James Levine conducting the Met orchestra. For information, 845-434-5750, ext. 4377.